I was looking for a eBook today at lunch and as I had just had a nice email from the folks at Border’s in Australia telling me that Border’s online was ongoing, business as usual, while the stores sank with no buyers for them, I thought I’d look for a book there. 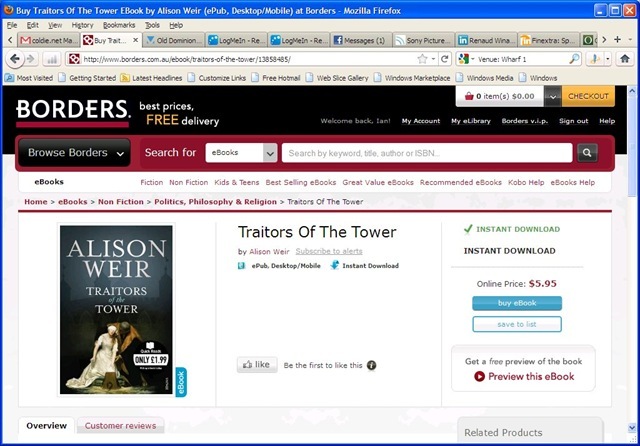 I came across what looked like an interesting historical piece from Alison Weir called “Traitors Of The Tower”. This is an account of the seven people – five of them women – who were beheaded in the Tower of London more than 400 years ago. Three were queens of England and the others charged with an found guilty of treason. Weir sets out to tell the stories of all of them. So, it looked like a good book. It was priced low as well, with the cost for the eBook being AU $5.95. Then I noticed the cover of the book (go on, press the image in this post and look at a bigger picture – go on, see if you can see it). Well, can you see it? Yes, the physical book cover shows a price of £1.99, which is just over AU $3.00. Nice one Borders – the eBook is more expensive than the paper one! Alakazaam-inofmraiotn found, problem solved, thanks!